This sounds good. It seems that a lot of books delve into the details of conflict in World War II but are weak in character and themes. Books that are stronger in character and themes sometimes are weak in the details. Based on your description, it sounds like you get both here. I think that’s a very perceptive observation, Brian. There are characters here that the reader can really identify with and invest in over the duration of the story. I guess that one of the reasons why I selected it for my book group. We have some readers who like character-driven fiction and others who crave a decent amount of plot. so hopefully this novel will satisfy both of these requirements! This sounds so good I paused reading halfway so I could open another tab and order it. The attraction of something written during the events was too strong to resist! It’s the thing that really struck me on this second reading – the fact that the novel was written at such a critical point in history adds an extra frisson of interest and excitement. I can’t imagine what it must have been like for authors such as Bates to be writing about the war at that time when the outcome of the campaign was still so uncertain. Oh, that’s great, Karen. I’m really pleased to hear that. Like you, I’ve never been tempted by The Darling Buds of May (probably for the same reason), but Fair Stood seems to be a very different type of story altogether. I think you’d like it. Ooh, I just bought this last year! It caught my eye mainly because my Granddad flew in Wellington bombers during the war, but it’s good to hear that it is worth reading for its own merits; I’m really looking forward to it now. Amazing to hear that your Grandfather flew in a Wellington bomber during the war! How thrilling and frightening an experience that must have been for him and his fellow airmen. Well, given that background, I think you’ll really enjoy the book. It’s so compelling and beautifully written that it’s hard not to get completely caught up in the story. I’m drawn to books written during the war, when the outcome isn’t yet known, and am glad to learn about this novel. I imagine it was popular when it was published as it shows the humanity found in many places, a contrast to the dreadful aspects of war. I haven’t yet read Bates and will look for this one after my break from book buying is over. Yes, me too. It’s one of the things that prompted me to read Mollie Panter-Downes wartime stories last year, the feeling of something being played out in the midst of all that turmoil and uncertainty. I think there’s a very strong chance that you’ll enjoy the Bates, particularly given the focus and the author’s prose style. As you say, one to bear in mind when you’re able to buy books again. I’ve read short stories and essays by Bates but so far I haven’t read any novels by him. He is a great writer though isn’t he? Absolutely. This was my first, but hopefully not my last. I actually had a look for a review of this at your blog but couldn’t see it, only pieces relating to some of the other books you’ve mentioned above. That explains why I wasn’t able to find it! Great review, Jacqui, as always! I feel I might love this one – I particularly liked the last quote you selected. Thanks, Juliana. I think you’d enjoy it too, it definitely feels like your kind of book. That last quote is lovely, isn’t it? Bates writes so beautifully about the landscape, as well as the people who inhabit it. This sounds wonderful. I have long been aware of this novel and H E Bates but never the author, and it’s a long time since I heard of the book from anyone. I do love books written during the war, there is an added poignancy isn’t there, in the author not knowing then, what we do now. Yes, absolutely. That palpable sense of uncertainty about the future really struck me on this second reading. As you say, there’s a degree of poignancy alongside the jeopardy which makes the story all the more compelling. I think you’d love this, Ali. It’s totally up your street. What beautiful prose Jacqui – the quotes you’ve chosen are lovely and make me want to read the book even though I’m not usually drawn to war novels. It’s so beautifully written. I know that seems an odd thing to say about a novel with a wartime setting, but there’s so much more to this story than the tensions between the Nazis and the Allies. There’s a strong sense of humanity running through the novel, a quality typified by Francoise and her family. It’s their grace and selflessness which make help make this story such a touching read. How spooky! I think it stands up very well to a second reading, largely because the characterisation feels so authentic. . 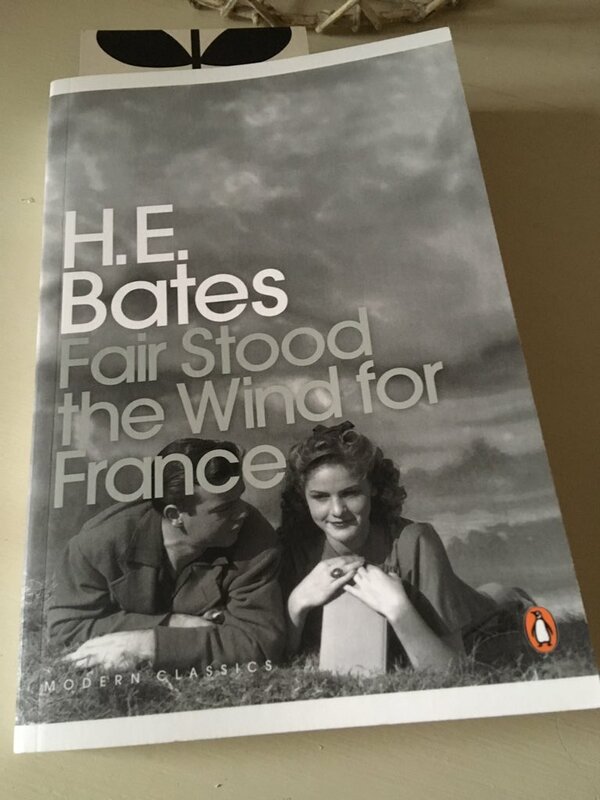 Check out the book, Fair Stood the Wind for France by H. E. Bates, as featured in this post on Jacqui Wine’s Journal blog. Many thanks for the share, Don Massenzio, much appreciated! Thanks for the link, Jacqui. This remains one of my favourite novels of all time. Bates’ granddaughter (?) emailed me after my review was published thanking me for keeping his work in the public’s eye, which I thought very sweet. Oh, how lovely! That’s so nice of her. I’m sure you’ve done a fantastic jog in championing this novel, especially as it remains such a favourite. A lovely review, and thank you for the link. One of my favourite novels, as it was my Mum’s too. Until re-reading it last year, I had never realised either that he wrote it during the war, which certainly added to the poignancy of the situation and the generosity of Francoise’s family was so touching. Very welcome, Annabel. There’s a lot of love for this novel, for sure. The emotions come through so clearly don’t they? I particularly like the fact that Franklin comes across as a rounded, nuanced character, so we feel his frustrations and concerns alongside his burgeoning affection for Francoise. Great review. So interesting to know that he wrote this when the outcome of WW2 was unknown. Thanks, Gert. Yes, I can’t imagine what it must have been to be writing about the war back then in the midst of so much uncertainty. At my book group last night we were wondering if Bates knew someone who had experienced a situation like Franklin’s, as the portal of the details and emotions felt so authentic. This sounds such a compelling read. I read Bates when I was about 11, one of the Larkin books, and I’ve not been near him since! You’ve definitely inspired me to seek him out. It’s very compelling, both emotionally and narratively, which gives the novel a relatively broad appeal. I’ve never read any of the Larkin books, probably on account of the trailers for the TV series which looked a bit twee! That said, there’s no danger of this one falling into the same trap. It’s beautifully written, in a heartfelt, sensitive way, with enough bite to give it a real sense of depth. I’ve always wanted to read this but it’s still on my wish list. I’m so glad you wrote about it. It sounds as wonderful as I thought it would be. His writing is lovely. Thanks, Caroline. I feel sure you sure you would love this. There are times when it seems a little reminiscent of James Salter’s The Hunters, another gripping story beautifully told. Excellent I must get the book. H E Bates has been one of my direct inspirations as a writer. His mastery of the craft helped shape the way I do my own poetry. Great book and a fine review, Jacqui. Thank you. I can understand why this writer would be an influence on others as his prose is so beautifully judged. This was my first Bates, but I’d like to try another at some point. Do you have a favourite you would recommend? Jacqui, his most well known set of stories is probably the group of 4 books that became a TV series in the Uk – The Darling buds of May – a rustic and joyous series. Start with that title if you read them. Otherwise I’ve found most of his work (short stories) to be a bitter-sweet melancholy, with not a lot to choose between them – I mean that in a good way. There is a character ‘Uncle Silas’ that pops up from time to time in the books – a delightful old seducer worth looking out for. Thanks very much, Frank – that’s very helpful indeed. Uncle Silas sounds like an interesting character, definitely one to look out for. As for the stories, I’m rather partial to bittersweet melancholy, so they may well suit me very nicely!